Twelve men invaded the shop last Saturday, destroying displays, wrecking books and chanting Alt-right slogans. One was wearing a Donald Trump mask. 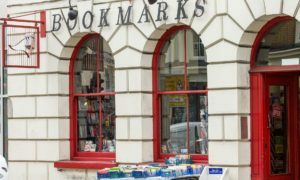 Since the attack Bookmarks the socialist bookshop has received messages of support from leading figures in the trade union and labour movements and thousands of activists from around the world. Bookmarks is holding a solidarity event in the shop on Saturday 11 August from 2pm. Throughout the afternoon there will author readings as well as speakers from the trade union and labour movement.